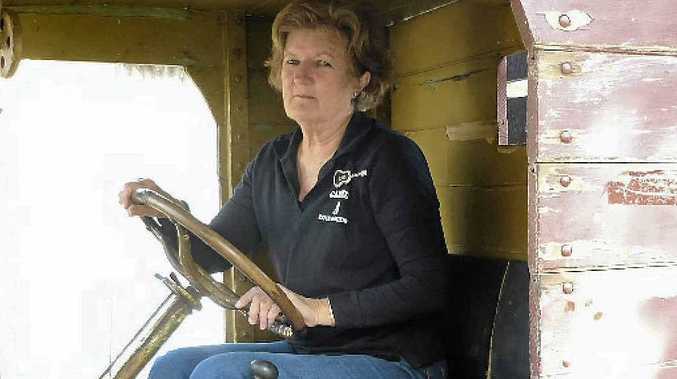 June Kealy takes the wheel of her old Chev recently. JUNE Kealy's old Chevy truck seems to be living the saying: they don't make them like they used to. The Forest Hill woman has owned the 1927 Chev (4) truck since 1986, when her father Albert Joseph passed away. He bought the truck second-hand in a time when people were still using horse and cart for transportation, to help move stock from the railway for his produce store. Albert Joseph's original store is still around the corner from Ms Kealy's home. She worked at the shop for nearly 50 years before making the decision to close it in 2008. And in all that time the old Chevy has kept running. "It's simply unique," she said. Except for a lick of paint, which Ms Kealy instigated, the truck is as it was back in 1927. June said the truck was originally painted blue but gave it a new look with a traditional maroon colour. "I still drive it around," Ms Kealy said. The one "ton" truck is 5.1m long and 1.85m wide and does not have doors or seat belts, but that does not matter because the top speed is only about 40kmh. Well it's just a guess really because the speedo is broken. There is also no knowing how many kilometres the truck has done as the dials no longer work. Riding in the beauty takes you back to a bygone era, where you cranked your engine by hand if it didn't go and used the choke to get things started. You feel the wind in your hair and if you want some air-conditioning, you pull open the windscreen, she joked. There's no indicators and you have to stick your arm out the window to signal in which direction you want to go. The truck had been sitting for a couple of years before Lockyer Valley Mayor Steve Jones expressed an interest in going for ride and Channel 9 filmed it for a segment on the news. Since then June has become something of an icon herself with people recognising her from the TV debut. Even though it has been sitting for a while it still starts like a dream. It takes premium fuel and the lights and horn still work. Ms Kealy said people always wanted to buy the truck, but she would like to see it left as it is. "Anyone can restore a truck," she said. "You can see them done up anywhere." "It did a lot of work in its time." The truck would pick up loads from the railway and bring them into the Forest Hill shop. Ms Kealy has driven it in parades and she's happy to show it off, but won't see it sit in a museum. "It's of more benefit still going, it's an icon," she said. "It's not done up or brilliant, but its never been off the road. It still has the original number plate."